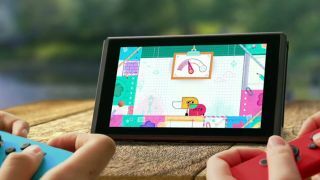 Nintendo's big presentation last week shed plenty of light on the upcoming Nintendo Switch, but we're seemingly still learning new things about the system, even if by accident. A leaked image posted on Twitter shows the handheld/console hybrid in action, showing off not only a few of the games we can expect to play, but also something a little more low-key: a 'Change User' prompt. The image below was originally posted by Nicalis, Inc., the publisher behind the Switch port of The Binding of Isaac: Afterbirth+. The post only went up for a bit before the company deleted it. If we're interpreting it right, the Change User function could mean the Nintendo Switch is capable of tracking multiple users on one device. If true, the feature would certainly be a plus for families hoping to share a console, as well as possibly making transferring account info from one Switch to another less of a pain, seeing as the current method allows only one Nintendo Network ID to be tied to a single Wii U or 3DS system. That said, it's unclear if this feature hints at multiple accounts on one system, or just multiple profiles on a single account, similar to services like Netflix. Additionally, the darkened background on the Switch's screen in the leaked image seems a touch different from what (admittedly little) we've seen of the console's UI so far – possibly hinting at customizable menu themes à la the Nintendo 3DS, as Engadget points out. While revealing this much about the Nintendo Switch was likely unintentional, Nicalis did manage to successfully tease something. It appears two of the company's indie darlings, 1001 Spikes and Cave Story, are now coming to Switch, making for a pair of welcome additions to the platform (even if they're not exactly brand-new).